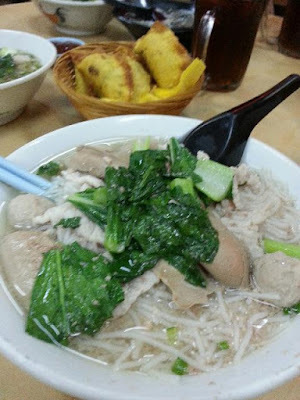 Sang Nyuk Mee Soup (Pork Noodle Soup) 生肉汤粉 is popular in KK. Several shops are selling Sang Nyuk Mee Soup from morning till night. As usual I always order meehoon instead of mee. I had this bowl of meehoon soup last night with an addition of slices of kidney this time. Each time I have had meaty meal, I feel fatigue and have difficulty in getting up the next morning. Do you think eating meat is acidic to our body ?? Yes, meat is acidic to our body. Try balance up your meal with vegetable and fruits. Why what a nice Mee hoon sup for dinner. For me, i think eating meat is very important coz meat have a lot of mineral and vitamin. That why i always have meat in my fridge. I will usually take soup with meehoon and never with the yellow mee.